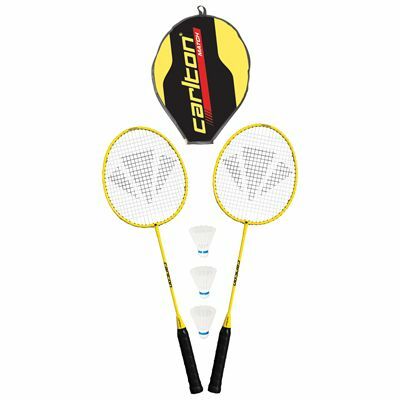 The Carlton Match 2 player badminton set is a great choice for recreational players that comprises of everything that is needed to play the game. It includes two steel rackets, 3 synthetic shuttlecocks and a zipped head cover that holds both frames. The rackets in the set are equipped with a steel shaft and have an isometric head shape that delivers a bigger sweet spot for more forgiveness even on off-centre hits. Each racket in the set weighs 120g (4.2oz), is 26.2” (665mm) long and comes strung with a nylon string. for submitting product information about Carlton Match 2 Player Badminton Set We aim to answer all questions within 2-3 days. for submitting product information about Carlton Match 2 Player Badminton Set. We aim to answer all questions within 2-3 days. If you provided your name and email address, we will email you as soon as the answer is published. for submitting product review about Carlton Match 2 Player Badminton Set.